Modern hanging lamps can be an expensive addition to any remodeling project. Some lamps can cost upwards of $2,000. Not surprisingly, most of this cost is justified by the value of style, not substance. 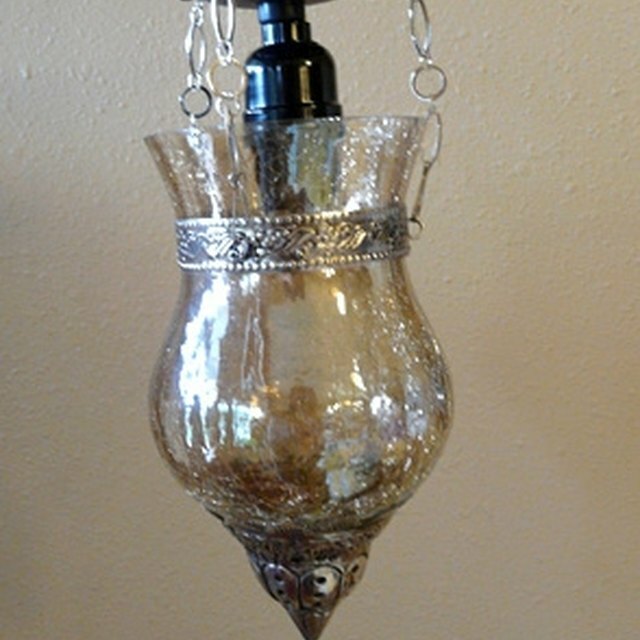 In reality most modern hanging lamps are constructed out of common flame-resistant materials. With a little creativity you can save thousands by making your own modern hanging lamp. Best of all, a homemade modern hanging lamp will give you a personalized touch to your home decor. A simple, yet provocative, modern hanging lamp. Turn off the circuit breaker for electricity running to the existing light fixture you'll be working on. Strip the existing lighting fixture so that just the wire and bulb are exposed. You will construct your modern hanging lamp around this. Tap the four "C" hooks into the ceiling, setting them into a square pattern equidistant from the center of the lamp wire. Cut the hanging chain into 4 equal lengths using the wire cutters. Each chain length should be as long as you want the start of the lamp to hang from the ceiling. Make sure that the length of chain will not allow the bulb of the lamp to be exposed. Cut a section of the bendable wire with the wire cutters into a length of approximately 15 inches. Bend the wire into a circle. Loop the four ends of the hanging chain lengths through the circle of bendable wire. Secure each chain length at four equidistant points using the hot glue gun. Measure and cut a piece of canvas into a rectangle that is wide enough to cover the circumference of the wire circle, and is long enough to reach your desired length for the lamp. Wrap one edge of the canvas' width around the wire circle. Cut out a small square of canvas (approximately 1 x 1 inches) over each area where the wire circle and chain length intersect. Fold the canvas so that the canvas edge wraps around the wire circle and so that the chain lengths are exposed through the canvas. Sew the flap of canvas using the needle and thread. Create another wire circle with the same diameter of the first one. Sew this wire circle to the other end of the canvas. You do not need to cut any holes out of the canvas as there should be no chain length on this wire circle. Hang the loose ends of each wire chain on one of the "C" hooks that are tapped into the ceiling. An optional step is to use acrylic paint to create your own design on the translucent canvas.